Bob Casey Jr. comes from a fine family and his name alone can get people elected. I am faced with an immense uphill battle just to prove to Pennsylvanians that I am worthy to challenge the revered Casey name. And, so, in this short essay, rather than first discuss my platform bullets--my solutions for a better America, let me talk to you about how well our Senator, not the Casey name, has done for the people of Pennsylvania. Tell me before I begin. If I were to display the finest platform bullets ever known to mankind, would you vote for me in the Pennsylvania Primary? I didn’t think so. The word on the street is that because the Bob Casey name has been on the street since the 1960’s when his dad wore the name so well, Casey is a lock for the Democratic nomination and with his huge campaign horde of cash, he will probably win in the general election. With just a meager budget, I am counting on the people of Pennsylvania to show the country that we can’t be bought by campaign cash and big names. It is my mission to stop Bob Casey from having a second term in the Senate. I think it can be done despite all the Casey cash and the great name. In a survey on approval ratings one of the commenter’s noted that about one third of Pennsylvanians have not even heard of Senator Bob Casey Jr. enough to have an opinion. Moreover, as more people learn how closely he is aligned with Barack Obama, his approval rating is dropping. Do you think those who take these opinion polls to approve or disapprove really know that the senator is Bob Casey, Jr., not his late dad, the former governor? You can bet a portion of those in the approval and disapproval columns are clueless also. “Where’s Waldo,” may be fun to joke about, but “Where’s Bob Casey?” or worse yet, “What about Bob?” would be no laughing matter for the Casey camp, and a moniker such as the “unknown senator” could surely help to make Casey Jr. a one term senator. Most voters like there to be a face behind a name. Better yet, there should be a person behind a name, no matter how good that name may be. Labels that a stealth Casey campaign may produce will not be flattering to the senator. There will be no bump in the approval ratings if Casey gets dubbed as “the unknown senator,” “the anonymous senator,” or worse yet, “Casey Obama,” to reflect his relationship with the president who he religiously tailgates and apparently adores. In December, 2011, the Kelly campaign invited Senaotr Casey to a series of modified Lincoln / Douglas style debates at the Barney Inn in Wilkes-Barre. This is a town much like Scranton and just 20 miles from the Senator's hometown. The Senator has proven in the past that he does not see any room for regular people to run for elected office. He proved it again when he ignored Kelly's request without even the favor of a reponse. Analysts see the Casey numbers as deceptively weak. There is a cost to hiding from the people. Even among Democrats, there has been little enthusiasm for the bland, milk-toast demeanor of the “unknown” Senator. The barometer for a senator who is well liked by the public is more often in the 70-80% approval range with voters of his own party. The too-strong Obama connection is more than likely the element that keeps Casey down in the polls. When even Democrats find out he is Obama’s front man in the Senate, they move him to the disapprove column. Nobody can deny that “Casey” is a great name in Pennsylvania because Robert Casey Sr. was a great man. In fact, Casey Sr. gave up a tryout for the Phillies to further his education. Can you imagine Casey at the bat as your campaign song? Who could beat that? Casey Sr. was a man with deep convictions, and he created a great name in Pennsylvania. In Bob Jr., however, more and more Pennsylvanians suggest the apple landed far enough from the tree that it looks like it may have been thrown from a car window. Yes, I am very concerned about running against the fine Casey name but not when it is framed as “Casey Obama” or the “unknown senator.” I think I can beat that. I do think it is appropriate that every Pennsylvanian know that Senator Robert Casey Jr. is not the man behind the great Casey name. I am not picking on the Senator or the family here. I think it would be fairer to all candidates in this election for the people to know that Senator Robert Casey Jr. is not former Governor Robert Casey, who passed away on May 30, 2000 after a fine public service career. The Senator is the former Governor’s oldest son so unlike some frauds that have come by over the years with the name Bob Casey, the Senator and the Governor are in the same immediate family but the one is not the other. Unfortunately for me, in Pennsylvania, Casey is a winning name, and Brian Kelly is my name. I do share the name with the Notre Dame Football coach. I am hoping Brin Kelly is a winning name for sure but it is the ND coach who has the only record to measure so far. Not only did Notre Dame execute poorly this year but in this state to suggest that Penn State fans are numerous is an understatement. Even so, I’ll keep my name. People have gotten elected in this state merely by using the Casey name. I have never forgotten that when a young Bob Casey Sr. was not permitted to run for another term as Auditor General of Pennsylvania due to term limits, he chose not to seek the office of State Treasurer, a job which ironically Casey Jr. held before being elected Senator. Just because Bob Casey Sr. chose not to run for State Treasurer in 1976 did not mean that the name Bob Casey would not be on the ticket. In 1976, in what could have been a spoof planned by some anarchists or the writers of Saturday Night Live, a county official, whose name happened to be Robert Casey handily won the Democratic primary and the general election. This Casey spent zero money and did no campaigning and still he won. Casey is that powerful a name in Pennsylvania. PA voters, naturally believed when they saw the vaunted Robert Casey name on the ballot, that the former Auditor General had changed his mind. They assumed they were voting for the outgoing Casey Sr. The Democrats did not complain at all since like all of the Casey’s, the new Treasurer was a Democrat. The Republicans, however, felt like they needed to call in Ghostbusters so that such identity theft (before it was even a crime) could not ever happen again in the future. In 1980, a few years before perfecting all his tools, Bill Murray, as the parapsychologist in charge, used his special wand (not a Proton Pack as many suspected) to help the Republicans discover and prove that "Casey isn't Casey." In 1980, with the Ghostbusters evidence before them, the people of Pennsylvania chose not to bring back the fraud Casey for a second term, but instead they voted for Budd Dwyer as State treasurer. Later, after a few mis-tries, Robert Casey Sr. was elected governor in 1986 and served until 1995. With Pennsylvanians so acutely aware that the name game can be used against us, it is highly unlikely that there will ever be another fake Bob Casey out there. So, a Ghostbusters II should not be necessary. My point in going over the power of a name is that a name does not really bring with it the person that you might expect. Just as I am not any of the Robert Casey’s, Robert P. Casey Jr. is not Robert P. Casey, Sr., and there are worlds of difference between the records of the two men. Bob Casey Sr. was his own man. Bob Casey Jr. is known best as being Obama’s man. In 2008, for example, he led candidate Obama through Pennsylvania on a bus tour as his guiding light. Even candidate Obama recognized the power of the Casey name. The Obama campaign hoped that Casey Jr. could help their candidate win over blue collar Catholic white men, a group that had eluded Obama to that point in Pennsylvania. Despite Casey’s best efforts Hillary won the primary though Casey was adjoined to Obama’s hip all through Pennsylvania. You may recall that Obama got nailed by the press when he called Pennsylvanians bitter and so, “… they cling to guns or religion or antipathy to people who aren’t like them or anti-immigrant sentiment…” Bob Casey Jr., when Obama needed him to come to his aid the most to refute this utterly dumb comment, was in stealth mode as the “unknown senator.” There was an issue and Casey does not do well with issues so he was mostly incommunicado. The mighty Casey could not undo such a major Obama gaffe. Bob Casey Jr., Obama’s man, eventually got to deliver what I would call a semi apology to CNN about candidate Obama’s slam to Pennsylvanians: "I have great confidence as we go forward, Barack Obama's values, his heart, his commitment to his faith and his commitment to change is going be a significant factor in him being the nominee." Pardon me if that sounds like a comment with no real meaning from an “unknown senator.” Please tell me what that means if it has meaning. Was he trying to get Obama to like him or was he trying to apologize to Pennsylvanians or neither? So, what was that all about? 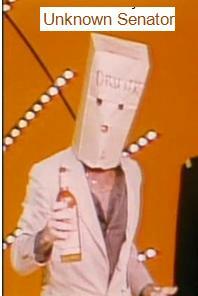 Perhaps it would have been better for Casey to have remained anonymous while the gaffe was hot. I think that the people of Pennsylvania are acutely aware of any fictitious Bob Casey, and that goes for Bob Casey Jr., Obama’s chief apologist in the senate. This time around, even by having the same name, Bob Casey is not going to persuade the people of Pennsylvania to vote for an unknown senator who comes to life only at election time or when he must help his new best friend, Barack H. Obama. One thing for sure, Obama is not a friend of Pennsylvania, no matter how good a name his friend Casey may bring to the table. Check his record. Better yet, check Obama's and you'll find they are quite similar. Hillary Clinton found out who the real Bob Casey is during the primary of 2008. Let's hope the people of Pennsylvania will render a similar verdict in the primary season of 2012, when along with a bunch of other inept politicians, Bob Casey Jr. is sent home for good.